Why us? We measure our success by your RESULTS. At Compass our number one goal is to help patients get well and stay well. We are committed to helping patients with ethical, evidence-based, understandable and accurate information so that the patient can maximize his or her benefits of care by making informed decisions. We are committed to identifying the cause of your pain, loss of function, and/or loss of quality of life. Once identified we can effectively provide you with recommendations to best resolve your symptoms, restore your function, restore your comfort and your quality of life. This approach allows us to create exemplary outcomes for our patients consistently over time. We operate from a foundational premise that loss of health, pain, loss of function, loss of functional ability, and loss of quality of life is not due to random chance. There are always causes that must be addressed. The clinical goal of our Evidence-Based Protocols is to identify and address the causes of your problems and restore your function and quality of life rather than to simply numb you to the effects (the symptoms). If you don’t address the causes, how can you ever get well and stay well and prevent further loss of health, damage, discomfort, and loss of quality of life? The only way to get better and stay better is to get and stay functioning better. Our Evidence-Based Protocols represent the most evidence-based and most effective interventions to restore and maintain your function, your health, and your quality of life. Why us? How we Adjust. We are equipped to adjust all people of all ages. We care for infants, children, adolescents, adults, athletes and elderly. Due to Dr. White’s unique training and experience he has the ability to care for people who have been told by other doctors they “should never be adjusted by a chiropractor” due to past injuries or surgical procedures. If you have fears or concerns please make them known. We want to make sure your experience is enjoyable and comfortable from the beginning. Our Evidence-Based Chiropractic Protocols and method of adjusting is simply the most up-to-date chiropractic option available to date. Why us? 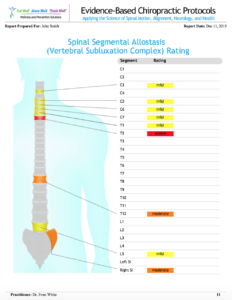 How we determine if we can help you: The Spinal Health Assessment. As a modern Chiropractic office, Compass is committed to using the most evidenced-based (research derived) protocols and reporting tools available for the purpose of communicating, detecting and addressing the cause of your health problems. Dr. White uses questionnaires, range of motion testing, functional ability testing, spinal examination finding tools, and digital x-ray (if necessary) to assess each patient to get an exact assessment of the entire spine. 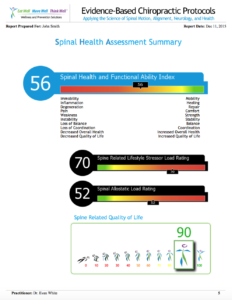 Our chiropractic assessment technology establishes a reliable, scientifically valid, quantitative, holistic representation of your current condition. This enables Dr. White to analyze a person’s condition more accurately, communicate findings more effectively, track the effectiveness of care over time and generate results at Compass Chiropractic. Why us? 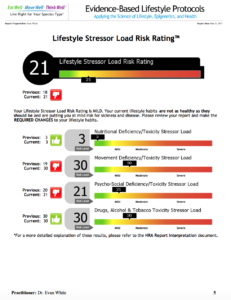 How we determine if we can help you: The Health Risk Assessment. 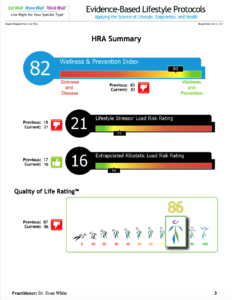 The Eat Well Move Well Think Well Health Risk Assessment (HRA) is the first health measurement tool that analyzes and combines data from the assessment of Lifestyle Stressor Load, Allostatic Load (body and mind system stress load and fatigue), and Physical and Psychosocial Quality of Life into a single and direct rating of your current and predicted future Wellness and Prevention status. The Eat Well Move Well Think Well HRA is the first assessment in history to allow patients and practitioners to assess and intervene within “the window of wellness and prevention” and thus prevent illness before it occurs. Equally as important is the fact that the Eat Well HRA opens the “the window of causation” and provides not just an assessment of current and predicted future health status but an assessment of the cause of that health status. This is truly revolutionary as it allows, for the first time, the ability to remove the cause of illness in order to recover health and/or to remove the cause before it has the chance to develop into symptoms, risk factors, or illness. This has been impossible with assessment that is based on diagnosis only. Intervening only after diagnosing a symptom or risk factor or illness has developed makes prevention impossible. Treating symptoms, risk factors, and illnesses instead of the factors that cause them can never recover health because the causes remain. Your Health Risk Assessment will answer these questions for you.